Colombia is one of those mysterious and amazing countries that we still know so little about. It might not generally be on your list of places to visit in South America, but that’s probably because you don’t know too much about it. There are some areas of extreme natural beauty throughout Colombia, and these are places you need to make sure you go see and experience as much as you possibly can. Now, one of the biggest tourist attractions in the country is the legendary Rainbow River. If you’ve not heard of this, you’re about to experience an incredible cultural awakening. 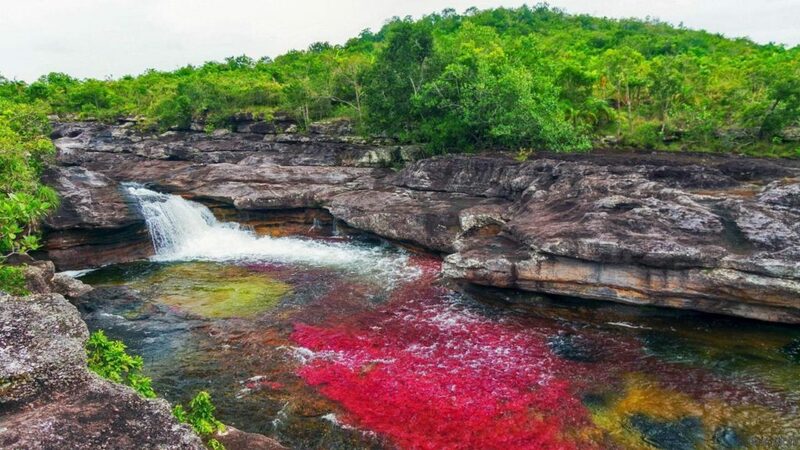 Cano Cristales, as the Colombians call it, is one of the defining features of the country, and one of the biggest tourist attractions in the whole of Colombia. So let’s find out more about it, and how those sensational colors came about! First things first – what is the rainbow river? 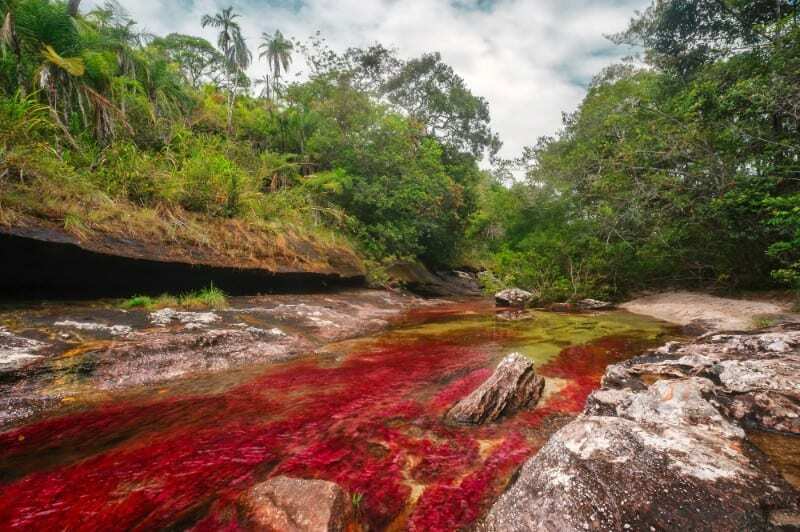 Well, as the name might suggest, it is a river that is located in Meta, in the Serrania de la Macarena province. The bed of the river runs with a multitude of colors between the months of July through November. Some of the exquisite colors that can be found in the river include yellow, blue, green, red (most commonly), and, even, black! As you can imagine this is quite the sight to behold, and, quite rightly, it has led to the river being named as the world’s most beautiful. To have something this stunning that is also natural is just amazing! Just east of the Andes, this 100km natural wonder is one of the most unique places in the world. The curious rainbow colors that form were often thought to come from moss or algae, but this has been disproven in recent years. It was actually found to be as a result of the multicolored riverweed that lies on the bottom of the river. This aquatic plant is known as macarenia clavigera, and it is a temperamental little thing. The plant requires exactly the right amount of sunlight, water level, and conditions in order to omit its stunning color display. This is why the river isn’t multicolored through the whole year. There are few places in the world as truly breathtaking as the Rainbow River, and visiting has never been easier. It used to be much harder to visit the river, as it was in guerilla territory for much of the early-’00s. However, things have changed in recent times, and it’s an incredibly safe place to visit now. 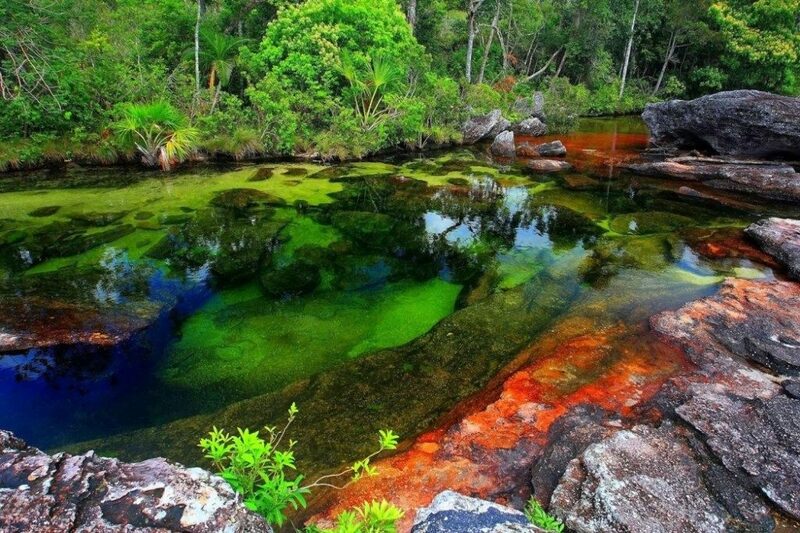 The military controls the area around La Macarena, making it the perfect gateway to Cano Cristales. If you ever decide to visit Colombia, you absolutely have to head straight for this breathtaking river. In fact, you can even organize to be part of a tour – catch a boat from La Macarena, then get off and hike the rest of the way – heavenly. This is one of the most vibrant, colorful, and breathtaking pieces of natural beauty in the world. You will never get the opportunity to visit a river like this anywhere else in the world, so make the most of it while you still can. Just make sure you get your timings right, and avoid dry season (January – May) or you’ll be disappointed.